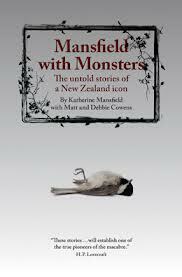 Sarumata: Mansfield with Monsters – critics say what? Mansfield with Monsters – critics say what? "It's a lot of fun, it's very weird... you get the original language and then in and out come these creatures... often, to my mind, the resolution involves the supernatural in rather stunning and wonderful ways... I will never see the little lamp in the same way again... it's rather gorgeous how that builds up... there is enormous fun to be had. I think secondary school students will love this to bits..."
"“Mansfield with Monsters” proved to be a remarkably entertaining read. The macabre twist added to each tale is always different, and always delightful. I found myself wondering with anticipation, as I began a new story, where the Cowens would take this one. The level of integration of new material into the stories is sufficiently seamless that I found myself trawling the Internet for the originals to make comparisons...No doubt the Mansfield purists will be rolling their eyes in horror, but I’d certainly recommend this book for those English teachers who would appreciate a fresh take on Mansfield, bored students who need a break from the traditional short story, and anybody who likes properly scary horror fiction. Expect to see this book up for the Sir Julius Vogel awards next year. Mansfield with Monsters has yet to be reviewed or rated on Amazon – we are very curious to see what ebook readers have to say!